Author Vincent B. Hargreaves has produced a beautifully illustrated and incredibly informative book on marine life for the home. This book comes 22 years after his first which he felt it was out of date and in need of updating. Not only is this book full of interesting ideas about setting up a saltwater aquarium, he also makes mention of which fish are better matched with others, what type of environment is suitable, and goes in-depth into lighting and filter systems. There are over 80 pages on fish alone and he also discusses the spectacular invertebrates, from which there are many colorful ones to choose. Hargreaves, a veteran of almost 3,000 hour's diving experience, and a respected authority on marine life, also includes a section on breeding, for those who would like to take their hobby to another level. 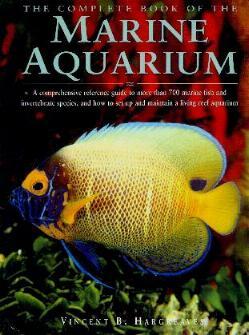 Having recently been introduced to a home aquarium, albeit a freshwater one, I found this book extremely helpful. I had no idea there was so much involved and I can now appreciate how absorbed in this pursuit people can become. Some of my favorite fish include the Mandarinfish (page 166), the Pantherfish (page 112), and the Dwarf Lionfish (page 108). MARINE AQUARIUM may be purchased and/or ordered through your local bookstore. Conclusion - A beautifully illustrated and useful book.